Not to be confused with Yuanli railway station. 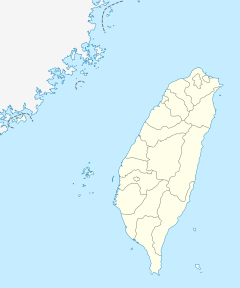 Yuanlin (Chinese: 員林; pinyin: Yuánlín) is a railway station in Changhua County, Taiwan served by Taiwan Railways. The station has one island platform and one side platform. The station is undergoing construction for conversion into an elevated station. Construction was originally scheduled to be completed in 2013, but was delayed to 2014. 1905-03-26: The station opens for service. 1961-03-28: A new, concrete station opens for service. 2007-09-01: The Yuanlin Elevated Railway Project begins construction. 2008-03-11: The station becomes a stop on the Taroko Express. 2009-06-29: The elevated track of Yuanlin Elevated Railway Project begins construction. ^ "各站營業里程-1.西部幹線". Taiwan Railways Administration (in Chinese). 11 December 2008. Retrieved 1 September 2018. ^ "車站簡介". Taiwan Railways Administration (in Chinese). 11 December 2008. Retrieved 5 September 2018. ^ "臺灣鐵路電訊". Taiwan Railways Administration (in Chinese). Retrieved 5 September 2018. ^ "臺鐵統計資訊". Taiwan Railways Administration (in Chinese). Retrieved 1 September 2018. Wikimedia Commons has media related to TRA Yuanlin Station. This page was last edited on 5 February 2019, at 17:43 (UTC).